MARCOM's "DOT HAZMAT General Awareness" Interactive CD-ROM Course focuses on employees who handle as well as transport hazardous materials. The course reviews a number of topics aimed at making employees more aware of situations in which they may encounter hazardous chemicals... and the nature of the hazards associated with the chemicals. 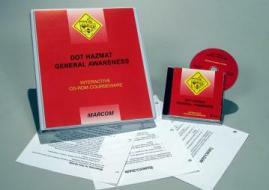 Created specifically for the Department of Transportation's HAZMAT training regulation on Handling and Transporting Hazardous Materials, MARCOM's Interactive CD-ROM Course "DOT HAZMAT General Awareness" provides the information necessary to comply with the regulation's "General Awareness" training requirement. (While this course can be used by itself, it can also be used as a companion product to MARCOM's DOT HAZMAT "Safety Training" Interactive CD-ROM Course). Areas covered in the course include the regulation itself, hazardous materials, definitions and classes, hazard communication, hazard "indicators", such as labels, shipping papers and placards, where hazardous materials may be encountered, packaging and shipping, transport (trucks, ships, rail, etc. ), storage, security issues and more. Using a powerful combination of audio, full-motion video, text and colorful graphics, this course provides the most cost-effective safety and regulatory compliance training available today. The course is divided into a number of logical sections so information is easily understood... and retained. Also designed with the training manager in mind, all courses in the Interactive CD-ROM Training Library include a learning management system (at no additional cost). Using this system, trainers can set up "Pre" and "Post" tests... establish log-in procedures... even define and set up curriculum for various job classes. The system also collects and organizes employee performance information through a powerful relational database, which can generate a number of record-keeping and tracking reports... and has a database "import/export" feature, which allows information to be transferred to and from an external database (such as a company's personnel database). The course is one of over 100 titles currently available in the Interactive CD-ROM Training Library.